This fall, Dr. Nicole McClure’s ENG 23 students participated in the first ever “Great Listen” sponsored by StoryCorps. According to the StoryCorps website, “The Great Thanksgiving Listen is a national assignment to engage people of all ages in the act of listening.” Students were asked to interview family and friends in order to learn about each other, themselves, and the world around us. The interviews were recorded using a new mobile app developed by StoryCorps found Dave Isay and were all uploaded to the Library of Congress to preserve a record of a collective national history. Dr. McClure’s students worked on the project for several weeks leading up to the Thanksgiving break, developing interviews and meeting with family. Students then chose a topic to research that would give context to their interviewee’s story. Projects ranged from family members marching in Selma in the 1960s, explorations of middle-class life in the 1970s, immigration experiences, the Vietnam War draft, and many more stories. 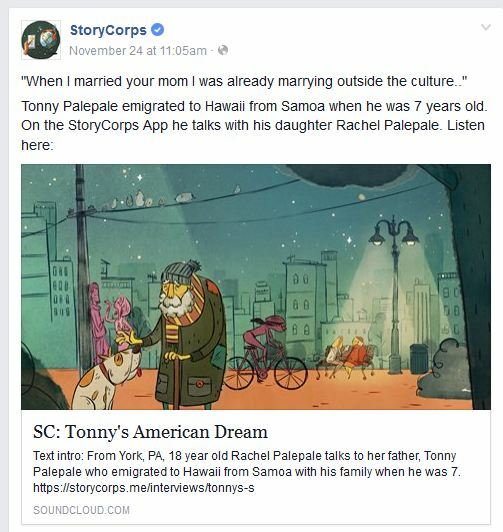 Freshman Rachel Palepale’s interview with her father was even featured on the StoryCorps Facebook feed. You can hear an excerpt from Rachel’s interview here.